Schools simply choose projects, programs, scholarships, after school programs, reporting hotline, mentor visits and/or fundraising events. Projects and Activities:Interactive Projects that can be implemented per class, grade level or throughout the school: A Picture is Worth a 1000 Words - Puzzle Piece - Hey, Me Too! - Â Word Play - Yell & Tell - Kickin™ It Crew - ChalkWalk - Time Capsule - Bullying ABC's - HighFive Bullying - Shield from Harm - Kickin™ It Creature - Kickin It Commitment - Start Spreading the Word - Interactive - Be Proud, Say it Loud! - United We Stand...Schools can choose as many or as little projects as desired, most with various student rewards. Incentive: by choosing 8 projects for students to complete over the course of the year. Upon successful completion of each project, the school will receive a Magnetic Slice of Pizza with a Letter on it. When all 8 letters are collected (spelling: K I C K I N I T) the students will be rewarded with a Pizza Party or another choice from the Student Reward Program. The Kickin' It Council: Over 80% of students say they trust their friends to an adult. Peers/friends do not have the knowledge and experience to detect hidden agendas and innuendo. Peers dont have the life experience to detect when a child needs more assistance than just listening. By providing a safe environment where students can vent, share, speak freely and openly ask questions, expressing their embarrassing comments without pressure, ridicule and harassment, will help alleviate the weight of students feeling alone, awkward and the stress of not fitting in. Students need to confide in a positive adult who is filled with compassion and is dedicated to reducing and minimizing the negative stresses that our students endure. The Kickin' It Council a Mentor/Peer Program, is designed for students to gather, vent, share, express themselves and their thoughts, while creating and implementing continuous anti-bullying projects and long term activities for the school to participate in. The Kickin™ It Council Mentor allows students a powerful healthy interactive relationship, that improve their confidence in a trusted adult. The program is designed to empower the students reassuring them their voice makes an impact and that they make a difference. The program is designed for students to feel a personal, relatable connection with the Kickin It Council Mentor. With the Council Mentors having knowledge and connections about current events and campaign role models who the students are excited to learn about. Â Their interest & attention is sparked, openly allowing the anti-bullying message to stay present and sink in. This Peer Program creates student-to-student dialog, as only the students have the power to change how they treat one another. This open dialog also provides a direct route of communication from the students to the Vice Principal and Principal, through the Kickin™ It Council Mentor. After each class the Kickin™ It Council Mentor summarizes the day, and reports directly to the Vice Principal or Principal to review, discuss, investigate and address any concerns or incidents the students shared. With this type of relationship, schools are notified of a situation long before they have time to fester and escalate into tragedy. Social School Anaylsis/School Safety Team: The Kickin™ It Council Mentor also monitors and works with schools through its Social School Analysis™ encouraging schools to meet a continuous safe standard and strive for excellence. Kickin' It works with and helps grade the school on several variables: staffs willingness to listen, remedy and follow through, effectiveness, enthusiasm, support, implementation of the anti-bullying projects and the continuous message, staff interaction, student/teacher interaction and the overall school climate. The program is designed to help improve the overall school climate and encourage schools make a conscious effort keeping the anti-bullying message present and our students happier and safer. Text Reporting Program:2010, in part, will be remembered for Bullying to the point of suicide, students from middle school to college, male and female, gay and straight, took their lives because their peers picked-on, teased, harassed and threatened them. With despair and hopelessness, these students turned to an extreme, permanent solution to escape their torment. Reporting a Bullying incident is the only way to help reduce such devastating repercussions. Students are encouraged to tell a friend, a teacher or an adult but statistics show that over 50% of bullying goes unreported! Over 90% of students fear they will be teased for reporting an incident and that same percentage admits to feeling anxiety and stress because they did nothing! Kickin™ It tackles this dilemma with an effective method that appeals to teens today. Kickin™ Its Anonymous Text Reporting Program empowers students to speak up and report what is happening, without suffering the pressure, stress and backlash. Kickin Its Text Program is easily implemented, participating schools are assigned a code for location identity, students text: BULLYNJ and their school code with details of where and who is involved. Kickin It will contact the school instantly and in some cases the authorities to investigate and assist. Students can report negative behavior, hurtful intentions and disruptions with the comfort of it being anonymous. Social Behavior Program: Students need to identify and differentiate between right and wrong, positive and negative behavior, healthy social interaction, emotions and etiquette. Kickin Its Social Behavior Program teaches students acceptable social skills, conduct, respect and compassion for themselves and one another, the effects of social exclusion and bullying behavior. The program includes 15 Rounds, which defines and differentiates 15 separate emotions we all experience. The program explores the core concepts that are central to emotions and behavior, exploring Â the internal-self, to help students balance their self-confidence and self-esteem, as a high percentage of students have a poor self-image, while some students have an overinflated view of themselves. Kickin Its Social Behavior Program; requires successful completion of assignments, reports, peer interaction, self-analysis and participation in interactive projects. The 3-part final exam includes a written report (with essay and peer interview) an oral presentation analyzing their personal social growth and their interaction during the Class Social Event. At the completion of the program the students are issued a certificate with one of three grade levels. This flexible program can fit any schools schedule. It can be inserted to cut a long lunch period or during advisory, club meetings, electives or as an after-school program. It can be offered as annual or semi-annual Minimum 25 to 45 minute classes. 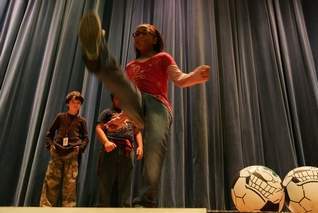 On-Site and After-School Programs:The Kickin It Up Program is designed to begin 15-20 minutes prior to the students lunch period & is an exercise/dance program. This program is designed to help decrease the negative social behaviors that students have to digest with their lunch. Allowing students to redirect negative energy and emotions increase students™ concentration and focus, therefore allowing the students to improve academically and socially. Kickin It Up a Notch, offers After-School Programs and Youth Memberships to various healthy outlets such as creative, animal care or athletic programs; including but not limited to martial arts, football/baseball camps, gyms, swimming lessons, etc., various ways to help release negative aggression and turn it into positive healthy energy, upon students meeting the conditions of the Commitment Contract. Kickin™ It K9s: The Kickin™ It K9™ and their friends share their anti-bullying message with lyrics and ryhmes to appeal to students of all ages. How children relate and interact with animals helps assist and detect various traits of social behavior. In some area, the Kickin' It K9's will visit the school library 2-3 times per month, for 1 hour per session. The students will be actively involved in various activities from reading books aloud, to learning compassion for animals and one another to identifying cruel behavior. Personal Visits:Bullying is a personal interaction and an anti-bullying campaign should be as well! Kickin' It takes its message on the road, visiting schools, gyms, martial arts centers and sporting venues across the county, conducting interactive assemblies, anti-bullying rallies and community gatherings throughout the year. The assemblies are hosted by a campaign role model Â who engages the sudents with their personal message and stimulates their minds with activities. 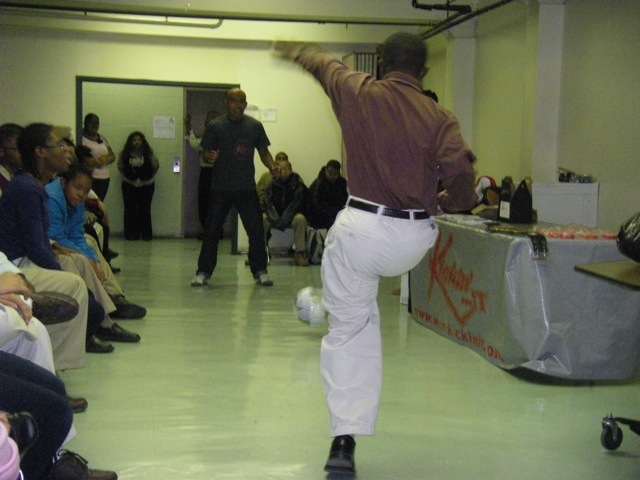 Financial Assistance: Kickin™It offers schools and organizations, many ways to financially assist in helping to provide the students with education, books, equipment, meal programs, mentoring workshops, after school programs, etc. KI offers simple to implement fundraiser's to Community Anti-Bullying Rallies where a school would host an event, a fair and KI would co-organize, co-promote and attend to bring the community together and providing campaign literature and support. Kickin™ It programs, events & fundraiser's are flexible; they can be designed to fit any school/organizations needs and guidelines. 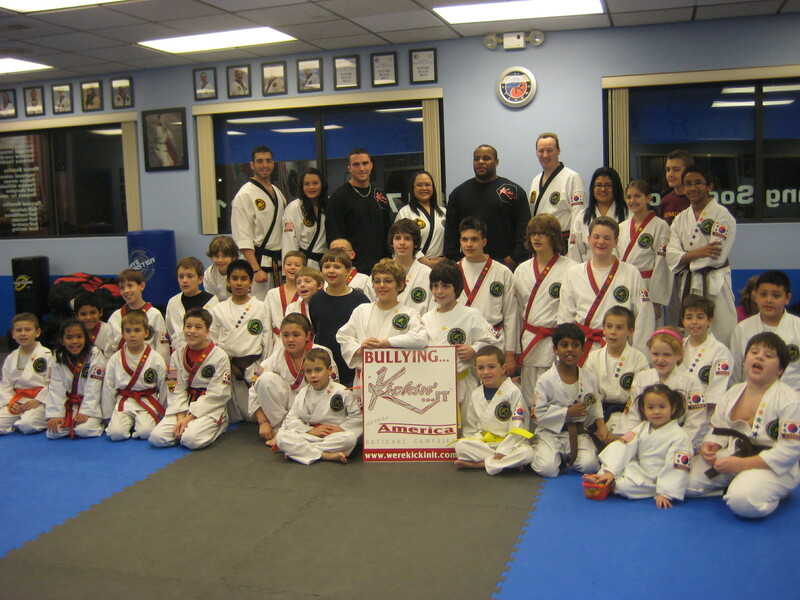 NJ Jersey City:Hudson Community is Kickin' Bullying out of their School. NJ Matawan: Mrs. Freehold Shanna Edwards spend the day, supporting students in their fight to knockout bullying. NJ Manalapan: the annual program schedule was kicked off with an interactive assembly. NJ Matawan: Rocky Marciano Jr., surprises the Kickin' It Council members encouraging them to continue in the fight to knockout bullying. Kickin' It with Your School!